What a relaxing trip to Jamaica! The travel started out a bit rough, having to arrive at the airport at 4:30am only to be helped by a grouchy Southwest Airlines ticket agent. This was a bit disappointing to me, as generally the customer service is quite spectacular which is a big reason why I use the company. Not to mention I worked there years ago in Revenue Management and Pricing. After a weak “hello”, the older woman asked me in a condescending tone, “Do you have your passport?” It was almost like she thought I wouldn’t! Then after I received the boarding pass, I asked if she could reprint it with TSA precheck since I have global entry. “No it isn’t,” she argued. Low and behold, there was my known traveler ID! So, the older woman proceeded to type the number into this new system, only to tell me it doesn’t work. I later found out she left off a 0. But anyway, she needs some training! The good news is, the only way my morning could go after that exchange, was up! The rest of the travel day went smoothly. I met my mom in Houston. Both of our flights were on time. We experienced the friendly Southwest service thereafter. We cruised through immigration/customs in Montego Bay and found transportation desk #16 where our hotel, Idle Awhile, had arranged our $80 taxi ride to Negril, the common fee. We were directed outside, where our driver Chris found us. He was a friendly chap. He almost always had two conversations going on at once. One on is cell and another one with us as he listened to our comments. He was funny! We sat in quite a bit of congestion near Montego Bay as the cruise ship was in port. Eventually we got out of town on the two way road with lots of potholes. We enjoyed the view of some lovely estates, the aqua water, and some small, somewhat dilapidated towns as we made room for many school children walking down the side of the road. I couldn’t have timed that better. What a lovely view at dusk. We enjoyed our drink and came back for dinner around 6. Our meal was pretty good. It wasn’t the best fish I had ever had, but it certainly wasn’t bad. And I got to try a Jamaican food I had never had, Bammy. Bammy is a Jamaican cassava flatbread. It reminded me almost of polenta. But it was good. After dinner we headed back to the room to relax and watch the Cubs after a long travel day. The tree frogs were chirping in full force. I shined the flash light on my phone on several trees until I finally found one. I was hoping it would have been vibrant green and purple or something. This one was just the usual greenish brown frog. They sure did create a nice chorus. The room included a lovely porch with a hammock, a comfortable king size bed, a loft, a sitting area, bathroom, and kitchenette. It was nice, though a little dark for those who can’t see. 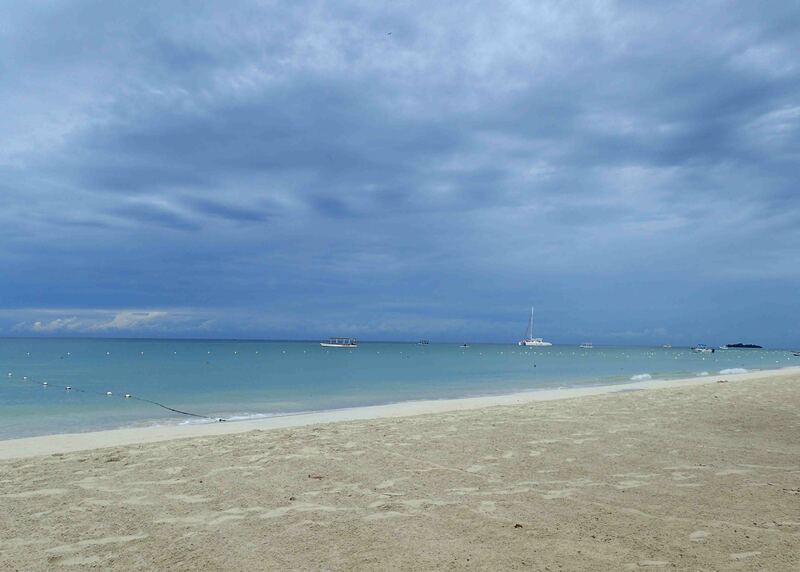 We both couldn’t wait until morning to set our eyes on Seven Mile Beach, ranked #1 on TripAdvisor for Things to Do in Negril. The beach didn’t disappoint. Though the morning was slightly overcast, the sand beach glimmered by the calm turquoise water. The hotel staff set beach chairs out for us beneath an umbrella. What I loved about the plastic beach lounger was the cushion for it was a white foam raft. If we got hot, we could just pick up the raft and go float in the Caribbean! We found after strolling along the beach for some time, that many of the nice hotels provided the white float with the beach chairs. I think this was a brilliant idea! Back on the chairs while reading our books, many vendors approached us…”fruit, juice, parasail, glass bottom boat tour, bracelet?” they would ask. A polite “No Thank You” sent them away. I’ve heard in Montego Bay and Ocho Rios the vendors are more aggressive. In Negril, they are friendly! Our days and nights, frankly were uneventful! We simply relaxed which was unusual but nice for me after being very busy at home in recent weeks. Instead of eating at the hotel this evening, we tried Jamaican food at Best of the West across the street from the hotel. All locals sat at the bar. We were the only tourists, and we took a two person table. I ordered the jerk chicken which was fantastic. My mom ordered the pork. It was almost black in color and SUPER hot. I only took one bite! I don’t know how she ate any of it. Once again, the locals couldn’t have been nicer and were pleased to take our photo. The next day was more of the same…laying out on the beach while reading. We also tried another new food I’d never heard of, ackee. It is a fruit in the soapberry family, but to me it almost tasted like squash. We switched it up the final day and took the complimentary shuttle up to the Idle Awhile Cliff resort. This resort had a pool just next to the cliffs. When we first arrived in the late morning, we had a choice of any lounge chair around the small lap pool. Only four more people joined us at the pool over the course of the day. The sun was blazing and the breeze was cooling making for perfect afternoon. Our lobster salad was spectacular. We hung out all day and chatted with a couple from Upstate New York. They have been coming to Jamaica for over ten years. In fact, most the people we met were repeat clients of the hotel. The nice part about the cliffs was the tranquility. There weren’t any vendors. In fact, the couple at the pool told us, they stay at the cliffs first to mellow out, and then they move down to the beach later! If we were staying for longer than a few days, that would have been a good option. Sounds like a relaxing stay, glad you got to escape the bustle and relax here 🙂 Ocho Rios may indeed have more engaging things to do, but also note it is more crowded.